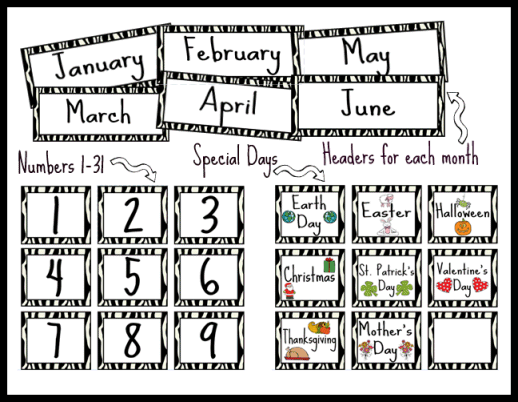 This calendar set includes headers for each month, number cards 1-31, and special day cards: Mother's day, First day of school, Last day of school, Christmas, Halloween, Thanksgiving, Easter, Field Trip, 100th Day of School, Earth Day, Valentine's Day, St. Patrick's Day, and No School Today. Each of the cards measure 3" wide by 2.5" tall. The monthly headers measure 7.5" wide by 3" tall-all in a stylish, zebra pattern for your classroom. Enjoy! 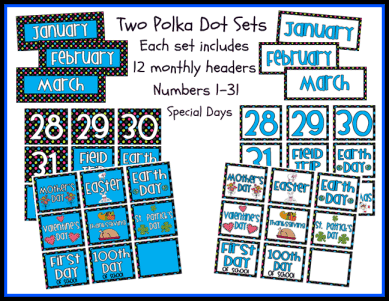 This resource includes TWO polka dot themed calendar sets for your classroom. Use them together to create patterns within your calendar. This calendar set includes headers for each month, number cards 1-31, and special day cards: Mother's day, First day of school, Last day of school, Christmas, Halloween, Thanksgiving, Easter, Field Trip, 100th Day of School, Earth Day, Valentine's Day, St. Patrick's Day, & No School. Enjoy! 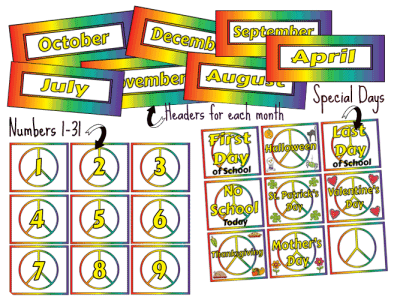 This calendar set includes headers for each month, number cards 1-31, and special day cards: Mother's day, First day of school, Last day of school, Christmas, Halloween, Thanksgiving, Easter, Field Trip, 100th Day of School, Earth Day, Valentine's Day, St. Patrick's Day, and No School Today. Each of the cards measure 3" wide by 2.5" tall. The monthly headers measure 7.5" wide by 3" tall. Enjoy! 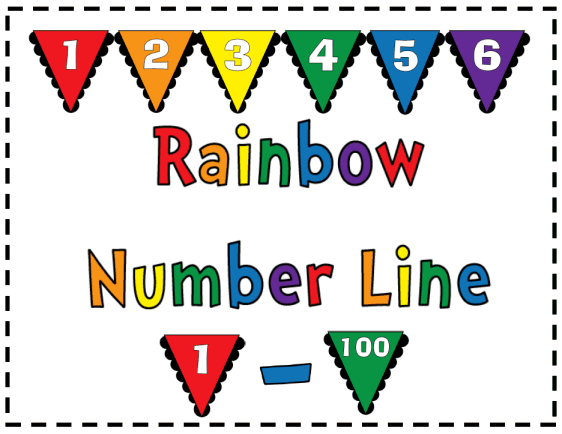 Download, print out, and laminate this rainbow bunting number line numbers 1- 100 for your classroom. Use just some or all of the numbers depending on the space you have available. Each flag measures 5.25 inches across. What a great, colorful resource for you to have in your classroom for those students to refer to when solving addition and subtraction problems. Enjoy! 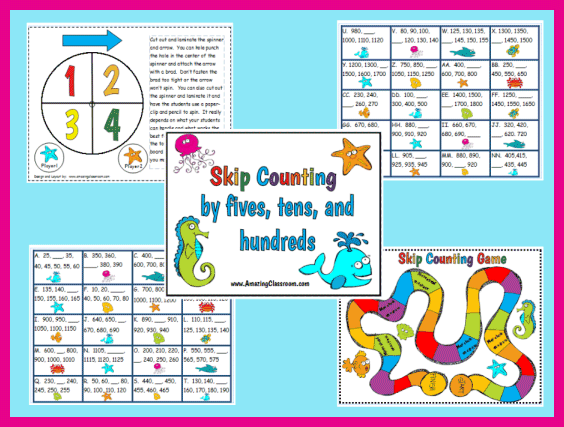 Your students will be sure to have fun learning to skip count by fives, tens, and hundreds while playing this fun, skip counting game. This game includes a title page for the manila envelope, a spinner, game board, 40 game cards, and an answer key so students can easily partner check one another. This math center covers the common core state standard 2.NBT.2. Count within 1000; skip-count by 5s, 10s, and 100s. Enjoy! This complete alphabet set features each letter of the alphabet in capital and lowercase letters, along with a word for the letter, and a picture featuring thistlegirldesigns. 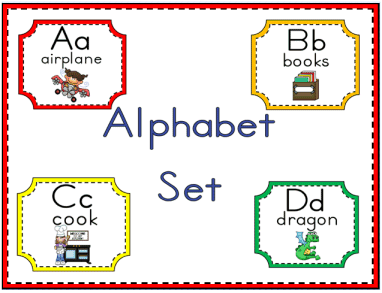 This adorable alphabet set would look great cut out, laminated, and posted to any classroom wall. Enjoy! 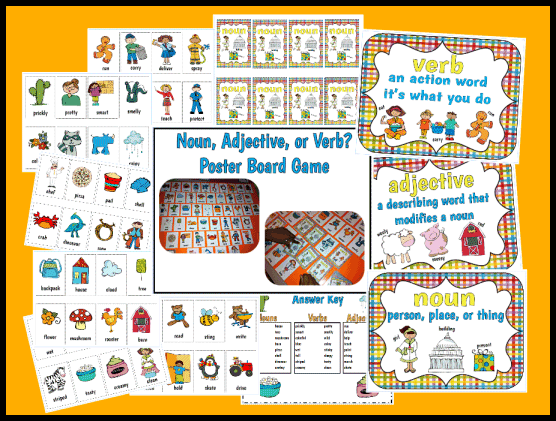 Just print out everything in this file and add to your own poster board to make a fun noun, verb, and adjective game that your students will love. It includes a total of 48 different noun, verb, and adjective cards along with their matches. This file also includes 3 posters to use for reinforcement of the concept or as a visual aid in your com arts or writing area of your classroom. Directions and an answer key are also included. Enjoy! 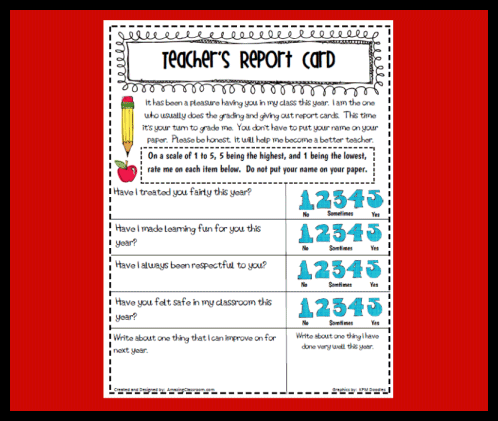 You have graded your students all year, give them a chance to grade you with this Teacher's Report Card! It will help you become more reflective and improve on your teaching for the upcoming year. I always enjoy looking at my students' responses - you will too! Enjoy! 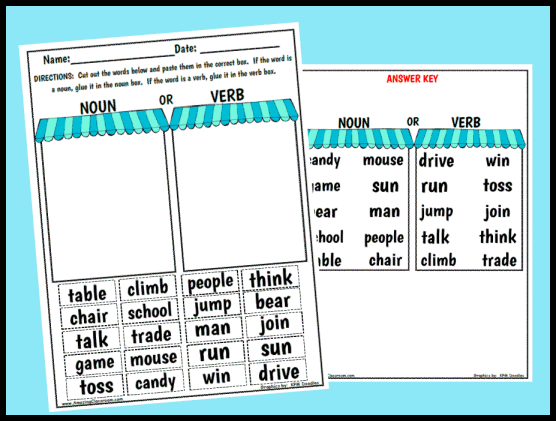 See if your students know the difference between nouns or verbs with this noun or verb sorting worksheet/activity page. The students cut out the words at the bottom of the page and glue them into the correct box, either the noun box, or verb box. Use as review, homework, or an extension activity. An answer key is provided for easy grading. Enjoy! 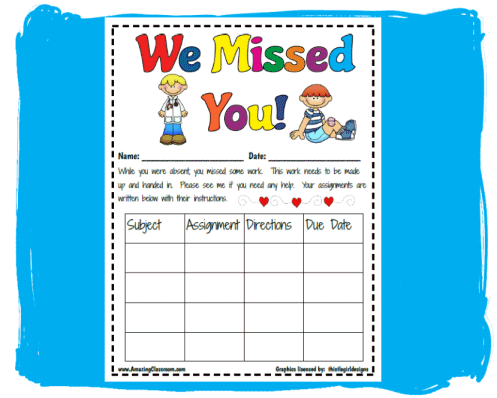 When students are absent, place one of these "We Missed You" pages at their desk. Each time you hand out a new assignments, attach it to the sheet with directions. At the end of the day, you have a form, and all of the work for when your student returns. Enjoy!